Cinemagraphs are still photographs in which a minor and repeated movement occurs. Cinemagraphs, which are published in either animated GIF format or as video, can give the illusion that the viewer is watching a video. The term cinemagraph was coined by U.S. photographers Kevin Burg and Jamie Beck, who used the technique to animate the fashion and news photographs. In the ever-evolving trade of eLearning, Cinemagraphs seems to be the latest to join the bandwagon. The eye-catching nature of cinemagraphs can be used to enhance learning with visual cues, to create easy and relatable graphics, and to strengthen marketing and memorability for learners. The actual creation of cinemagraphs used to be a complex process, but newer technology make these great graphics simple to create and great candidates to incorporate into and enhance eLearning. Unlike videos, cinemagraphs are more like static photos that include a small area of looping animation. There are also different types of cinemagraphs, there are those that also exhibit slow motion or time-lapse qualities or there are those that remain true to the format they were filmed or shot in but cut down to specific frames. 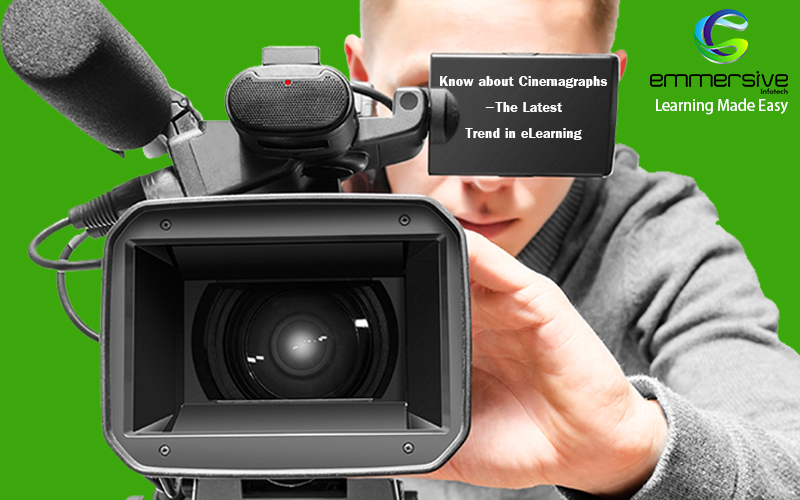 These are many reasons for which the cinemagraphs are slowly becoming very essential and integral part of the new eLearning trends that have entered the market on the basis of new technological advancements and new ideas in the industry. You can also use animated GIFs and cinemagraphs to tell a story. There are many applications and softwares available in the internet which helps to produce high-quality cinemagraphs. The main purpose of making cinemagraphs is to create the perfect amalgamation of cinema and photograph. They tend to inherit the story-telling qualities as picture is worth a thousand words. A cinemagraph can be added as a background to a course or just to the intro screen. It can be either loaded as a GIF or as a video but needs to be ensured that your file size is on the lower end and your quality remains intact. In the modern sense of creating content specially for the eLearning courses, cinemagraph backgrounds seems to be the most dynamic, expressive and which helps to liven up the design. The animated GIFs and cinemagraphs can be used to show a process. This is the most unique way to display to the users, the complete steps and procedure of any activity which is hugely beneficial in terms of developing elearning courses for the learners. It is the most essential part of making cinemagraph and fully utilizes the purpose of deveices such new trends in the elearning market. The cinemagraph captures attention in a more natural way than colors or diagrams. The visual learning cues are more natural, more eye-catching, and possibly more relatable than imagined drawings or arrows. There are no bright red arrows drawing our attention in real life. In addition to drawing attention and identifying things of importance, cinemagraphs may also be used to demonstrate a process in a similar fashion as a video. This ease of use means learners can easily access full content from their course across platforms and devices. Cinemagraphs encourage continuous learning in any environment. In an Internet world teeming with loud graphics and busy animations, the subtlety of the cinemagraph incites a pause of attention from a viewer and in the terms of marketing elearning content, it has the convenience of sharing content among the internet in an easy and fast manner.